Tuner or CD/DVD player (or similar source) where the source device has a 180 degree 5pin DIN output socket. Turntable or record player (via phono pre-amp). Tuner or CD/DVD player (or any other similar line-level source) where the source device has a 180 degree 5pin DIN output socket. Turntable or record player (requires a phono pre-amp to boost the signal up to line level). 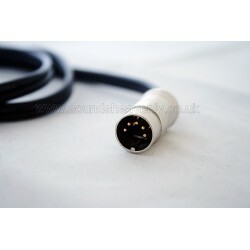 This cable is primarily used to connect a Quad FM3 to 33. Please contact us if you need advice on whether this cable is suitable for your equipment.